BANG TAO: With more than three months still to go until the Laguna Phuket Triathlon 2008 on December 7, the “Race of Legends” has already sold out. 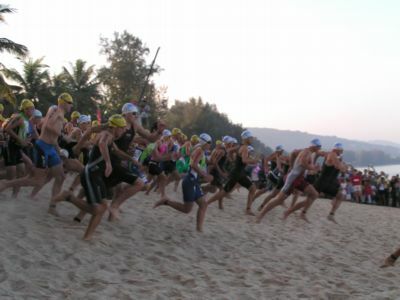 Some 750 athletes and about 50 teams of participants rushed to secure their places through online bookings for the 15th annual Laguna Phuket Triathlon after dates for the international competition were announced. The event comprises a 1.8-km swim, a 55-km cycle ride and a 12-km run. There will also be the usual 6-km fun run, which is still open for entries, plus a new addition: a race especially designed for children – details of which are yet to be announced. During the triathlon, athletes will run and ride from the Laguna area on the west coast of the island, up to the north of the island and back to Laguna again. They will be passing through jungle and rubber plantations and along beach fronts and villages. The race will include athletes swimming the first 1,200 meters in the sea before sprinting 100 meters across the beach to swim the last 600 meters in a lagoon.